The Regera was created as a luxury Megacar alternative to Koenigsegg's traditional extreme lightweight race-like road cars. Even though the One:1 and the Agera RS have surprising levels of practicality, creature comforts and features, their primary focus is, and has always been, to be the overall fastest cars on the planet - around a racetrack or elsewhere. In spite of all its advanced technology and creature comforts, the Regera is comparatively light. Therefore it can still perform competitively around a race circuit. 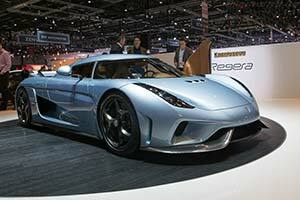 According to Koenigsegg, the only Hyper/Megacar that could be faster around a circuit, is another Koenigsegg. A side effect is that the LED's make the whole lamp cluster glitter and shine, as if there where diamonds thrown into them.